Afghanistan’s jihadi insurgents are ready to give America what it wants: defeat without humiliation. 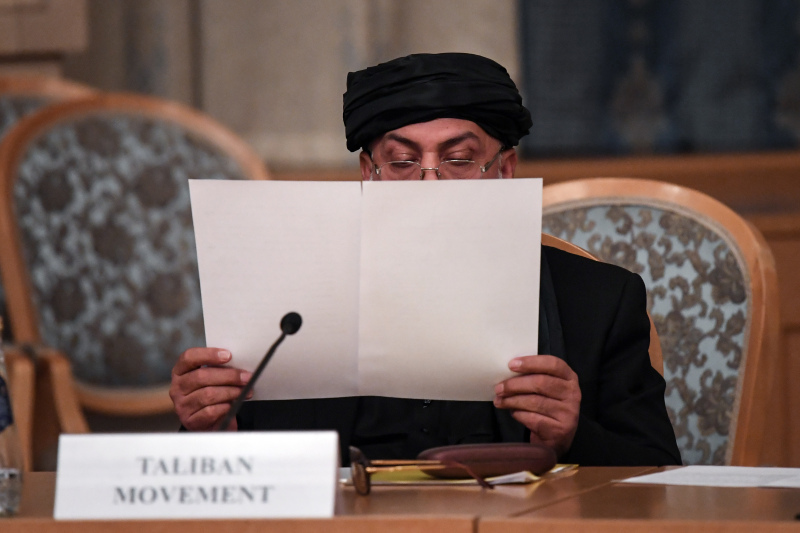 A Taliban representative attends international talks on Afghanistan in Moscow on Nov. 9, 2018. 31 Jan 2019 – In the peace process now underway with the Afghan Taliban, one-and-a-half significant U.S. interests are at stake. The “half” is the only real hang-up to signing a deal and bringing home American troops right now. For Afghans, of course, the stakes in the present war are different and infinitely higher than for Americans, for whom the only vital interest is also the easiest to achieve: a Taliban agreement not to host international terrorists themselves and to do their utmost to prevent Afghanistan from once again being used as a base for terrorism against the West in general and the United States in particular. One can be confident that the Taliban would not only agree to this but also follow through on the agreement. It’s not just because Taliban supporters and interlocutors, in public statements and private conversations (including my own), have almost universally, if grimly, acknowledged that hosting al Qaeda in the run-up to 9/11 was a dreadful mistake that cost them their rule over Afghanistan. It’s also because the Taliban are now engaged in a bitter fight with the forces of the Islamic State (who most certainly are anti-Western international terrorists) for control of parts of Afghanistan. The Taliban’s role as an enemy of the Islamic State (as well as prudent preparation for the possible collapse of the U.S.-backed order in Kabul) has led Russia and China to launch talks with the Taliban. Finally, while the Pakistani military has backed the Afghan Taliban as a client movement against Indian influence in Afghanistan, it has absolutely no interest in encouraging a repeat of 9/11 and the disasters that followed for Pakistan. And if Pakistanis did have any such intention, their Chinese backers (with their own worries about Islamist extremism in Xinjiang) would deter them very strongly. The second real U.S. interest in the process is what is called in Washington “credibility” but which is better known by its older and more honest name, “prestige”—in this case, the avoidance of obvious and humiliating defeat, which would undermine respect for U.S. strength and embolden U.S. enemies elsewhere. As a U.S. general told me a decade ago, he and his colleagues could not say what victory would look like in Afghanistan, but they could all say what defeat would look like. It would look like Saigon in 1975. In the case of Afghanistan, this would most probably however take the form not of outright Taliban victory but of the collapse of the Afghan state, followed by Taliban victory over large areas and deepened and permanent civil war with other ethnic forces. Apart from prestige, there is also a concrete U.S. interest in preventing such an outcome. Such a full-scale civil war would lead to a greatly increased flow of Afghan refugees to Europe. Given what happened because of the Syrian refugee crisis, this could deal a death blow to liberal democracy in Europe, and the resulting European nationalist backlash would crush the entire image of U.S.-led democracy in the world. To prevent it, however, would require agreement with and major concessions to Turkey and Iran, undermining America’s geopolitical position in the Middle East. The key question therefore is whether a deal can be struck with the Taliban concerning control over the Afghan state, and if it can be reached, whether it would stick. The key question here is not culture or ideology—but power. Afghanistan already has an Islamic constitution, which can be tweaked to look even more Islamic. But in terms of power at the center, the Taliban will inevitably demand either a strong central government in which they will have a very large share or a neutral government (perhaps under a new parliamentary constitution) with very little real power. And whatever happens, they will demand de facto (though not necessarily explicit and formal) control over their core areas of support in Greater Kandahar, Greater Paktia, and Kunduz, including de facto military control by Taliban forces incorporated into the Afghan National Army and police. To judge by their record in the 1990s, most ordinary opponents of the Taliban in these areas would be allowed by the Taliban to go home in peace. Hard-line anti-Taliban leaders would have to leave or die. The questions therefore are whether such a power-sharing agreement could be reached between the existing Afghan state and the Taliban, and if it were reached, whether it would stick at least long enough for the United States to withdraw without humiliation. If such a deal collapsed after a few years—well, that would be dreadful for Afghanistan, but the U.S. public would have forgotten all about Afghanistan by then, and no doubt the U.S. establishment would find someone else to blame for U.S. failure. At present, it looks quite impossible for the Kabul government to agree to such terms. Washington can, of course, coerce it by the threat of unilateral withdrawal but has then thrown away most of its ability to maintain any pressure on the Taliban. This is where the region comes in. To restrain Taliban behavior after U.S. withdrawal will not in fact be the task of the United States but of Afghanistan’s neighbors—Pakistan, Iran, China, Russia, and India—and they should therefore be centrally included in the peace process. But of course, present U.S. relations with Russia and China hardly allow this, and the United States does not have direct relations with Iran at all. Chinese help is also needed to influence Pakistan not to seek to use Afghanistan as a base for terrorism directed against India. There is one thing that the United States can give China, Russia, and Iran in return for their help and which it must give up anyway as part of any agreement with the Taliban. Any idea of long-term U.S. bases in Afghanistan—which China, Russia, and Iran fear could be used to threaten them—will have to be abandoned. This is something the Taliban are absolutely bound to demand, and the United States should find it easy to give. For far from being strategic assets, these bases are in the long run somewhere between a strategic liability and a collection of hostage camps. Given their geographical position and the virtually certain long-term instability of Afghanistan, it would be strategically foolish to leave U.S. forces there permanently. Apart from anything else, they are not a true threat to Iran but on the contrary an excellent potential target for Iranian-backed attacks. Anatol Lieven’s book, Pakistan: A Hard Country, was recently published in an updated paperback edition. He is a professor in the war studies department of King’s College London and a senior fellow of the New America Foundation.